Photo: A standby generator will provide electricity and light needed on campus when our solar system is not capable to do so during cloudy days. We are happy to report that the installation of the new plumbing system and the new water tower will be completed within two weeks. We’re in the process of installing a motor pump to route the water from the water well source to the main tank, to the orphan home, to the bathrooms, all throughout the campus, as well as to the medical center, the school, and to the people in our local community. The plumbing system will enable us to have running water with taps on the entire campus as well as connecting the water to the main house so that we can have bathrooms with running water. The new plumbing will bless our girls and the children as they will now have access to clean water in our orphan home and at school, to more easily wash their hands after visiting the toilets, thus improving their hand-washing and sanitation. The new concrete water tower will help the water flow easily to all of the needed places around campus, and will also save time and energy in the lives of our girls and the children — before now, they have had to pump water manually. The water tank is being constructed near the main house in order to provide the home with water pressure to activate the plumbing system. The only steps left in the construction process are to build a small shelter with four water spigots near the roadside where the people of the local community can access our clean water. Photo inset: (Top-left): The new water tower on our main campus is nearing completion. (Top-right): Workers install plumbing which will enable running water on the entire main campus. 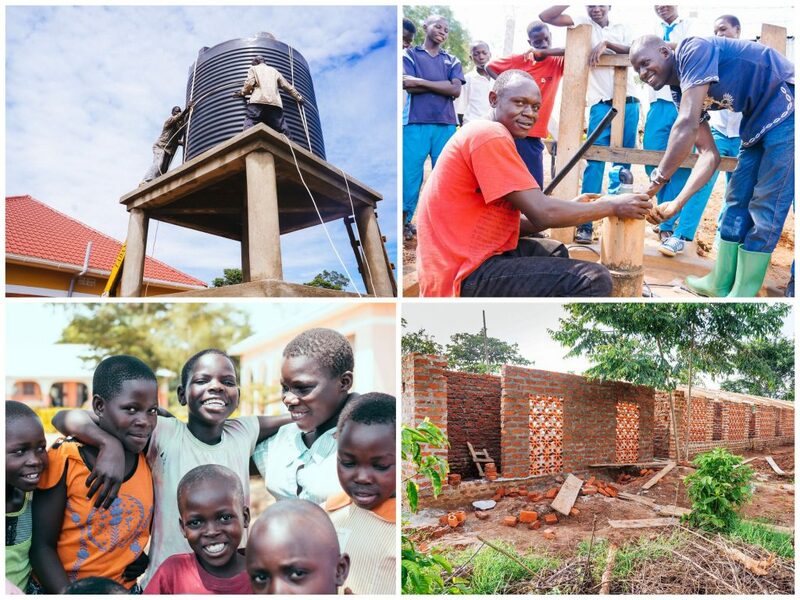 (Bottom-left): Children from the local community are excited that they will have expanded access to clean water from the new water tower. (Bottom-right): Our newly expanded piggery is under construction and will allow room for growth. In other good news, we have ordered a new solar power solution to be installed soon, which is being funded by a grant from the French foundation, Fondation Total. The new solar solution will be a major upgrade from the existing small-scale solar generator currently on campus. 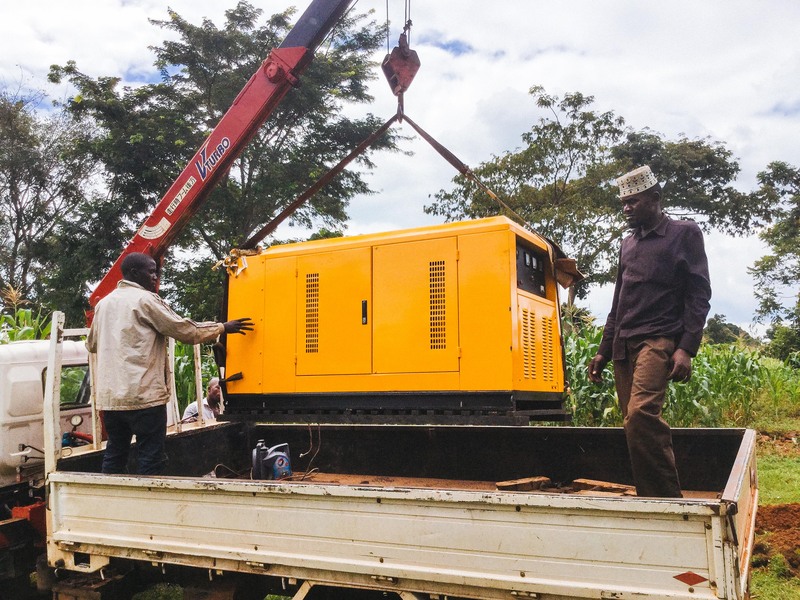 In this part of Uganda there is no public electrical service whatsoever, thus we needed to come up with our own power solution, and we are grateful that this beneficial addition to our campus will soon be installed. Thanks to your contributions and donations from our generous donors, we are also installing a standby generator in the event that we have problems with our solar power, especially when there is no adequate sunshine to power the solar power system. The standby generator is powerful enough to pump all of the water needed on campus, to provide enough power to light up the whole campus, and to support all of the electricity needed on campus as well. The standby generator installation should also be complete within two weeks after we finish laying down cables to connect all of the buildings on campus. We also recently constructed an expanded piggery that sits on a quarter of an acre of land on our main campus. We are currently raising 32 pigs; we will wait until we’ve bred 100 pigs before selling them at market. We raise a breed of pigs called Landrace pigs — their sows produce large litters of piglets with very good average daily gain and high lean meat content ideal for pork production which adds protein to the children’s diets, and sells well at market. We also raise chickens, turkeys, and cows, so we are able to provide the children with important vitamins and nutrients, and protein and fiber, to give them energy and strength. As always, we are thankful for your generous support which makes improvements such as these possible, blessing the lives of our girls, children, and students.